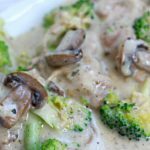 A creamy sauce is spooned over mushrooms, tender bites of chicken (and optional broccoli). A delicious dump and go recipe that you can make with frozen chicken. Add mushrooms, chicken, butter, broth, Italian seasoning, seasoned salt, pepper, garlic and onion powder to the Instant Pot. Cover the pot and secure the lid. Make sure the valve is set to sealing. Set the manual/pressure cook button to: 10 minutes (thawed breasts), 12 minutes (frozen breasts), 12 minutes (thawed thighs), 15 minutes (frozen thighs). When the time is up let the pot sit for 5 minutes (display will say L0:05) and then move the valve to venting. Remove the lid. Place the chicken on a cutting board and set aside. Turn the Instant Pot to the saute setting. Stir in the broccoli. If using frozen broccoli run hot water over it before adding it to the pot so it doesn’t cool down the food too much. Combine the warmed half and half (I use the microwave to warm it for 1 minute) and the flour in a bowl and whisk until smooth. Ladle a cup of the broth from the Instant Pot into the flour/half and half mixture. Whisk until smooth. Whisk the mixture into the Instant Pot. This will thicken the sauce in just a few minutes. Stir every 3o seconds until thickened. Slice the chicken into desired size pieces (I just used a fork to cut it into pieces). Add the chicken back into the pot. Salt and pepper to taste. Turn off saute setting when the sauce is thick and the broccoli is cooked through. Serve chicken, mushrooms, broccoli and sauce over pasta, potatoes, rice, garlic toast or just eat it plain. I used my 6 quart Instant Pot Duo 60 7 in 1*. You can use your 8 quart with no changes to the recipe. You can double the recipe in your 8 quart. If you want to use your 3 quart you can but you’ll probably have to halve the recipe. Increase the cooking time by 2 minutes when using your 3 quart. I made this with 8 ounces of mushrooms. I would have preferred more mushrooms. They shrink down so much! Next time I’ll use a whole pound of sliced mushrooms.